Dog bites and attacks are very common and can cause serious injuries, including permanent disfigurement, nerve and tissue damage and psychological trauma. In extreme cases, dog attacks may result in death. If you have been attacked by a vicious dog in Seattle or elsewhere in Washington state, you may need the help of the experienced dog bite attorneys at Davis Law Group to get compensation for your losses. In addition to the serious physical injuries our clients must recover from, being attacked by a dog can be a very emotionally traumatizing experience. Victims hire the award-winning dog bite attorneys at Davis Law Group to help them pursue justice when negligent dog owners cause them harm. We believe that every successful dog bite recovery starts with the injured victim having up-to-date and accurate information about the legal process. Attorney Chris Davis provided much of this information for free and we encourage you to read our book, When the Dog Bites: The Essential Guide to Dog Bite Claims in Washington, and to browse our website to find out more information about dog bites and the insurance process. If you or a loved one has been injured after being bitten or attacked by a dog, it is important for you to act quickly to protect your rights. Davis Law Group has the experience and expertise necessary to conduct a proper investigation into the circumstances of your injuries and who may be responsible. Contact us today by calling (206) 727-4000. Man dies of massive infection just 10 days after being bitten on the hand by a wandering dog. Our firm recovered a $975,000 settlement for his family. We negotiated a $500,000 settlement for a woman who was attacked by a pit bull on a public roadway, scarring her face and ripping off part of her lip. Our firm negotiated a $300,000 settlement for a dog bite victim who was attacked by a neighbor's pit bull mix. She suffered severe, gaping lacerations to her face and nose. Who Pays for Your Dog Bite Injuries? The owner of any dog which shall bite any person while such person is in or on a public place or lawfully in or on a private place including the property of the owner of such dog, shall be liable for such damages as may be suffered by the person bitten, regardless of the former viciousness of such dog or the owner’s knowledge of such viciousness. A business, veterinarian's office, etc. You have the right to feel safe when you are in public, whether that's at a local business or a veterinarian's office. If a dog bites you at a place of business, you may recover damages. A public park. Seattle and Washington state have a variety of on-and-off leash dog parks. Owners are responsible for any injury caused by their dogs in these spaces. On the sidewalk. If a dog bites you or a loved one on the sidewalk, you should hold the owner responsible for injuries caused. Owners must take precautions to prevent this from happening. Someone else's home. A dog's owner is liable for injuries their dog causes in their own home. Dog owners are legally responsible for physical, emotional, and economic damage caused by their dog attacking another person. The statute applies regardless of whether the dog has a history of vicious behavior, which is an important distinction. What If There Was A 'Beware Of Dog' Sign? Many homes have "Beware Of Dog" signs which warn a person that a dog is present on the property, usually as a deterrent for trespassers. If a person trespasses on a property equipped with a "Beware Of Dog" sign, they may have a difficult time proving that the dog's owner is responsible for their injuries. However, if the person has a legal right to be on that property - if they were invited or had business at the property, for example - then presence a "Beware Of Dog" sign would not necessarily absolve the dog owner of liability for any injuries a person may suffer as a result of a dog bite. What if the Owner Doesn't Have Insurance? When the dog owner denies having insurance, you still may have a legal remedy. In the unfortunate event that the dog's owner has no insurance, there are several things that both parties should strongly consider. First, both sides should seek out the advice of an attorney. Attorneys can work with their respective clients to negotiate the terms of the victim’s compensation. Puncture wounds. The most common type of injury in a dog bite incident, puncture wounds are painful and may lead to more serious injuries. Infection. If a dog bite wound does not receive immediate and proper medical treatment, serious infections may set in. Psychological issues. Dog bite victims may be left with serious psychological issues, including post-traumatic stress disorder, after an attack. Nerve damage. A dog’s bite can pierce the skin and do significant damage to the nervous system. Some injuries may be permanent. Scarring. Bad dog bite wounds can leave victims with life-long scars that act as a reminder of the attack. Facial injuries. Any dog bite attack victim can suffer injuries to the face, but children are particularly at risk. Wrongful Death. Dog bite attacks can result in death. Holding the owner of the dog responsible for a loved one’s death is key. Attorney Chris Davis has handled some of the most notable dog bite & animal attack cases in Washington State history. 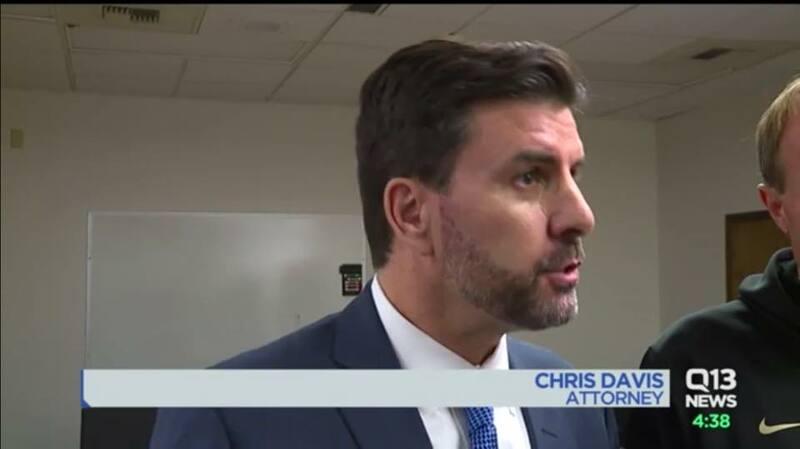 As a prominent personal injury lawyer with nearly 25 years of experience, Mr. Davis is often featured by local or national news media covering dog bite issues and/or some of his cases. 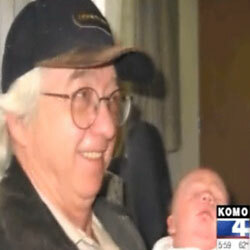 You may have him on local stations such as KING5, KOMO4, KIRO7 and Q13Fox. Here are just a few cases you may have seen in the news. Click here to see video of TV interviews. UPS Driver Mauled by Four Pit Bulls. A UPS driver attacked by four pit bulls in Puyallup in September 2017 is currently working with attorney Chris Davis and has appeared in TV and news radio interviews with Davis over the course of the case. 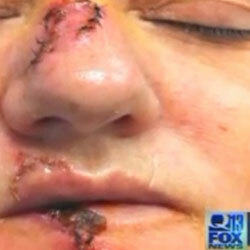 Woman Mauled by Two Pit Bulls Outside Tacoma Smoke Shop. A woman was viciously mauled by two pit bull dogs in a Tacoma area shopping center, suffering serious injuries to her face, arms and legs. You may have seen Donna and Mr. Davis interviewed on InsideEdition. 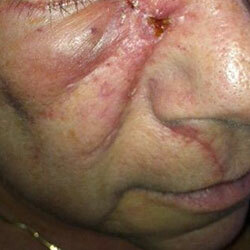 Woman's Face Disfigured in Pit Bull Attack. A woman suffered serious injuries to her face when she was attacked by a pit bull while crossing a Burien. She was disfigured in the attack, with the majority of the damage done to her mouth and chin area. The case made the news when the owners started a legal fight to try to keep their pit bull from being put down. Mr. Davis appeared at hearings and supported the victim during news interviews. Man Dies from Dog Bite Infection. Just one day after being bitten by a dog with a long history of aggression and other bites, a Burien man developed severe pain from a bacterial infection caused by a bacteria commonly found in animal saliva. The case drew media attention when the family hired Davis Law Group to file a lawsuit to seek justice. At Davis Law Group, we tell people that every case is different. For that reason, there is no true "average" settlement when it comes to injury cases, especially so for dog attacks. We have handled dog bite cases ranging from $50,000-$60,000 settlements to $975,000. And with so many factors at play, you shouldn't listen to the insurance company when they say your case isn't valuable. In 2015, the Insurance Information Institute and State Farm did a study on home insurance claims for dog bite incidents. They found the national average for dog bite settlements was $32,000. But other studies have shown that by hiring an attorney, victims get 3.5 times more in settlement money, even after attorney fees are deducted. Dog bite cases can quickly become a headache, and the legal issues may take years to sort out. It is up to you to decide whether or not you want to pursue a claim. Before you make a decision, however, it is important to know how a dog bite case works in Washington. The steps you take after a dog bite are crucial. Getting medical attention, contacting the proper authorities and making sure you document your injuries is just the beginning of the dog bite recovery process. The 9 mistakes dog bite victims make. Did you already speak with the insurance company? Was it recorded? Learn the common pitfalls to avoid after an attack. Know how to pay your medical bills. It might not be plainly obvious how to pay your bills after a dog attack. You need to know the most common ways victims have their medical bills paid. Attorneys can make the difference. It may sound expensive, but hiring a dog bite lawyer requires no up-front payment. Your lawyer doesn’t get paid unless you win. Expert witnesses can be key. Your attorney will know the right experts to hire for your case in order to maximize your injury claim. If you or a loved one has suffered serious injuries after being attacked by a dog, Washington state law permits you to file a claim for financial compensation against the dog owner. You may just want more information about dog bite legal claims and common insurance issues. If that's the case, attorney Chris Davis offers his free book, When the Dog Bites: The Essential Guide to Dog Bite Claims in Washington. The award-winning attorneys at Davis Law Group will review your dog bite case absolutely free and help you better understand whether you would benefit from hiring a lawyer. Call our office in Seattle at (206) 727-4000 or use the confidential contact form on this page to have your case personally reviewed by our attorneys. "We felt support immediately and the entire team has been kind, respectful and very supportive." "I think he Chris Davis is the best person in the world"
"I can't say enough how happy and thankful I am"
"We appreciated their straightforwardness, management of expectations, and willingness to answer our many "what-if" questions." ?How Do I Find The Right Dog Bite Attorney? ?How Much Does It Cost To Hire A Dog Bite Lawyer? ?How Do I Pay My Medical Bills After A Dog Bite?